(Lancaster, Pa., June 22, 2016) - Atlantic League (ALPB) fans are in for an exciting evening when they pass through the gates of Clipper Magazine Stadium on Wednesday evening, July 13th. The All-Star Game is coming to town, and, not only will fans be enjoying Minor League Baseball at its finest, they will also have the unique opportunity to experience the Lancaster farming community at its best. 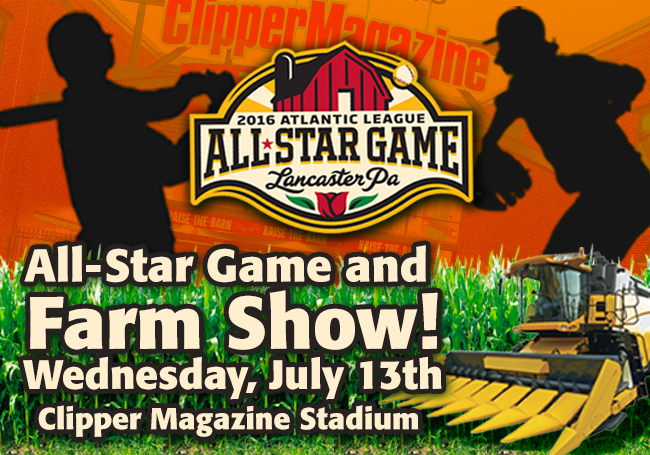 Talented and deserving baseball players from the eight Atlantic League clubs will square off in this spectacular All-Star Game and Inaugural Farm Show. This marks the second time that the ALPB All-Star Game has been held in Lancaster. In 2007, the North All-Stars toppled the South by an 8-6 margin in a thrilling, home run-filled game that had fans talking about it days later. This amazing evening will be proudly dedicated to both the rich cultural heritage of the farming community as well as the exhilarating future of the agricultural industry in Lancaster County. Businesses from all over the county have generously stepped forward to help sponsor this inaugural evening. Insurance brokers, banks, farm equipment manufacturers and many other local businesses who all specialize in supporting the farming community felt it was important to be a part of this celebration knowing that one-fifth of the sponsorship money will be given back to the Lancaster County agricultural community for research into new technology. The Farm Show experience will begin as soon as fans arrive at the front gate of the ballpark with exhibits ranging from the latest in solar technology and vintage tractors to delicious hard-boiled eggs from a local egg production facility. An interactive educational trailer will also be on hand where fans can learn of significant advances in the agriculture community through the years. Once fans step inside the stadium, they will truly experience that “farm feel” when they see cows, alpacas and sheep on the left field hillside. There will also be several tables on each concourse that will feature local businesses who specialize in supporting the farming community and who will share their farming products and services with visitors. Another show of support from the community will be the Lancaster Young Professionals; a group of vibrant working women and men who are committed to the economic improvement of both the City of Lancaster and Lancaster County. They will be sponsoring an “Urban Farm Feel” event for their members in the Hess’s BBQ Pavilion showcasing methods and benefits of growing one’s own food within an urban setting. The Barnstormers are honored to have Pennsylvania Agriculture Secretary Russell Redding in attendance that evening. An invitation-only VIP “Farm to Table” reception with Mr. Redding will be held on the second floor suite level. Food for this exciting reception will come straight from Lancaster County farms and will be lovingly prepared by the Executive Chef for the New York Yankees. During the reception, Fisher and Thompson, a local innovative company in the farming community, will present an interesting video featuring their robotic milking machine. Bill Burgess, President of Lancaster Farming Newspaper, will also be on hand to discuss the economic impact of agriculture on Lancaster County. The reception will also feature other Agribusiness leaders who will share their thoughts and expert opinions on the farming industry. This fun-filled evening will be packed full of promotional events and games between innings that will be centered around the agricultural theme ranging from alpaca, mascot and tractor races, to a real cow milking contest. One of the most exciting events of the evening will be a very special guest appearance by Iowa farmer and reality TV star Chris Soules. A native of Arlington, Iowa, Chris first came into the public eye on the 10th season of “The Bachelorette.” He was so popular that he later became “The Bachelor” for season 19 of that show. Soules has also appeared on “Dancing with the Stars.” At his heart, however, Soules is a man of the land. He is a fourth generation farmer with a degree in Agricultural Studies from Iowa State University. Watch for him in the cow milking contest! Gates for the All-Star Game and Farm Show will open at 5:00pm. The annual Home Run Derby will begin at 5:30pm, and, at 6:00pm, our Inaugural Farm Show should be in full swing. Finally, at 7:00pm, fans can settle in and watch the top baseball stars in the Atlantic League perform on the field with bragging rights at stake. Lancaster County residents, and fans of the Atlantic League will not want to miss this spectacular evening celebrating our players, our farmers, and our heritage. Tickets are available at www.lancasterbarnstormers.com, by stopping into the Two Dudes Box Office at Clipper Magazine Stadium or by calling 717-509-HITS. The Lancaster Barnstormers and the Lancaster Farming Community have humbly come together to give Lancaster Barnstormers fans, Lancaster County residents and guests from all across the Atlantic League a true taste of what makes Lancaster County and its farming community special. The Lancaster Barnstormers are in their twelfth season as a member of the Atlantic League of Professional Baseball. Home games are played at Clipper Magazine Stadium in downtown Lancaster, Pennsylvania. Please call 717.509.HITS (4487) or visit www.LancasterBarnstormers.com for more information.